I was so excited (in a makes-me-want-to-jump-up-and-down-and-clap-my-hands kinda way) when I reached out to one of my favorite bloggers and handmade artists, Julie Ann of Julie Ann Art, and she agreed to be interviewed on my blog this week. Some time this past fall, I can’t pinpoint when exactly, I started reading the blog Julie Ann Art, and it quickly became one of my favorites. Between her tutorials and recipes, the way she opens herself up to readers and shares her experiences as a small handmade business owner, I was hooked. How did you get started making greeting cards? I started making greeting cards because I wanted to be able to create something that held a purpose. My Etsy shop first offered paintings and prints but once I tried out cards it was like it was the “right thing” for me to be doing. There is a meaning behind every card I make and there is also a meaning behind every customer’s purchase and that’s so special to me. The flexibility is fun! To be able to use my time the way I want to, and more importantly to do things I ENJOY doing, is something I am still not used to. I ran my business for a long time while having a day job so having the freedom to put as much time as I want (or need) towards my own business is the best thing I could ask for. But, that flexibility can also be challenging! I’m still trying to figure out the balance between work and break time. There’s times when I’m not working when I feel like I should be, and vice versa. Lack of inspiration is never a huge problem for me. I feel so lucky to be a part of such an amazing online handmade community, all I have to do is catch up on blog reading or check my Instagram feed to become inspired. Seeing other people pursuing their businesses, creating new products, celebrating business growth, it’s what it’s all about and it’s what I want for myself too. In general, I feel like the handmade movement has completely taken off. When I first started selling on Etsy the majority of people I told about it had never heard of it. The best promotion I can do for the handmade movement is to buy handmade things myself. Most often when I get asked where I got something I can proudly say I bought it from a great shop on Etsy. Since I have gotten more involved with vending at local craft shows I always try to promote those as well. When you are not designing greeting cards, what do you like to do with your time? Work hard. Have no expectations. Be patient. It takes time to build a following that enjoys your product and wants to support what you do. Don’t give up! Thanks so much for joining on my blog, Julie Ann, and be sure to check out her shop! Those are seriously cute cards! Love these quirky cards! Julie Ann has my kinda humor! Awesome interview. I love how Julie dabbed on a few things before she found the “right thing”! Aren’t they? I bought some other celebratory ones, and I definitely need to buy more! 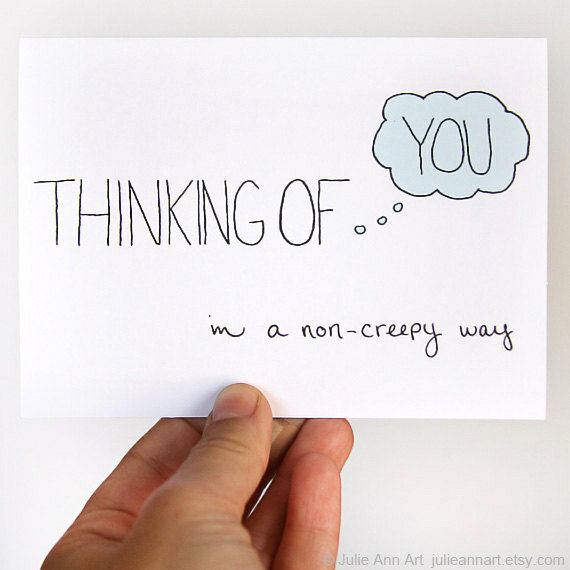 Haha, I love the card! It is an awesome business and Julie Ann has done amazingly well. I know, as a creative business owner it makes me feel like there is so much possibility. 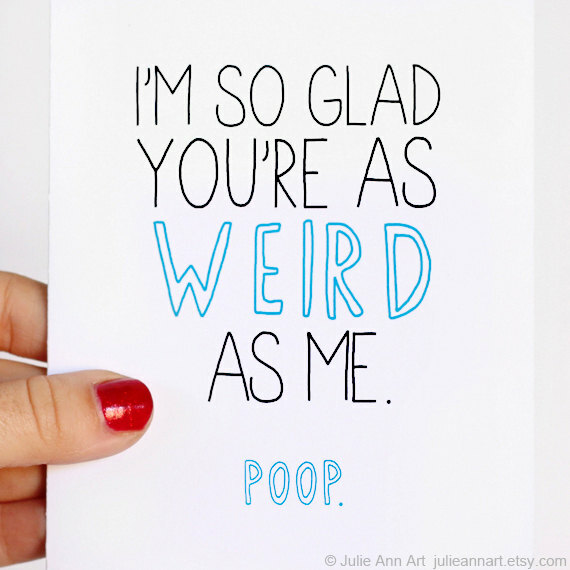 Julie Ann’s greeting cards are so funny and quirky. This is a very fluid interview Bev!